Nick Carter, Master Detective -- "The Case of the Candidate's Corpse"
Nick Carter, Master Detective aired "The Case of the Candidate's Corpse" on September 26, 1948. We have run but five previous Nick Carter episodes out of over 350 since we began this OTR feature in 2009, and it has been quite some time since the last one. Realizing that we have new listeners finding us each week, I am copying below the original introductory material I wrote for that first episode some 5 years ago in 2011, followed by story notes for this specific episode, which I chose because of its political setting which, in this summer of 2016 and the runup to the Presidential election in November, is proving to be one of the most bizarre political silly seasons in memory. 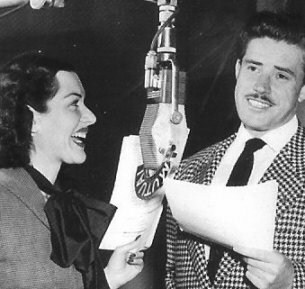 Nick Carter on radio ran a respectable twelve years, from 1943-1955, but the famous detective's history begins much earlier. During the post-Civil War era known as Reconstruction, a short story featuring Carter appeared in an obscure fiction paper (The New York Weekly) in 1886 (predating the first Sherlock Holmes story by two years). The publisher was none other than Street & Smith, a fledgling, struggling publishing firm which would later become the most dominant pulp magazine publisher in the world. Among its later titles would be Astounding Science Fiction (now Analog), the only magazine from Street & Smith to survive the pulp magazine crash of the 1950s. From Nick Carter's beginnings in 1886 through his final radio show in 1955, Carter would change with the times; from clean-living detective, master of disguise, to anti-espionage agent, to the bane of mad scientists or the defender of scientists beset by crooks, Nick Carter has enjoyed one of the longest surviving, most popular runs in various media for over 100 years, for when his radio show ended in 1955 he would resurface (yet again!) in a series of James Bond-type paperback novels in the 1960s which ran into the 1990s. Virtually forgotten today, Nick Carter predates Dashiell Hammett's Sam Spade, Raymond Chandler's Philip Marlowe, and was originally inspired by the real-life exploits of private investigator Allan Pinkerton. In this episode, a pompous, puffed-up, self-entitled politician seeks Nick's help in stopping a threat against him during his run for re-election. The politician (as if politics wasn't a circus in itself) has brought in a carnival as a publicity stunt to draw crowds during one of his appearances, but it seems he has brought in serious trouble as well. There's murder, an Oriental dancing girl who figures prominently, and plenty of scheming and deception to go around. A perfect episode for this Presidential election year, which may turn out to be the silliest season of them all. A final note of some interest is that there were some 250+ Nick Carter spy novels written from 1964-1990, "Nick Carter" being the house name under which the novels were written. Wikipedia provides more detail and tells us that: "None of the Nick Carter series of books carried author credits, although it is known that several of the earliest volumes were written by Michael Avallone, while Valerie Moolman and NYT bestselling author Gayle Lynds wrote others, making this the first series of its kind to be (significantly) written by women. Bill Crider is another author identified with Nick Carter."